Our surroundings shape who we are as individuals. They influence our collective identity. Whether it is our built environment of homes and streets, our social or cultural environment in which we were raised, or the natural environment that surrounds us all, the world around us impacts us deeply. 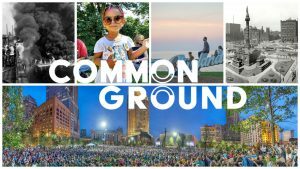 This summer, Common Ground will bring the community together to discuss this impact — past, present, future. How has your environment changed? How is it better? How can we work together to keep improving?